Inspired by George Markides' ( @georgiemark) plot of ELA financing by the CBC at pictwitter I have plotted the same data but added some other balance sheet lines from the asset and liability sides of the monthly balance sheet. The red line is Emergency Liquidity Assistance that peaks at €11.4bn in March 2013. It is interesting how 'Lending to euro area credit institutions related to monetary policy operations' falls to compensate in part the rise in ELA such that the total asset/liability value rises to a maximum of €19.3bn in June 2012 before falling to €15.8bn in March 2013. Help with interpretation of the other stuff much appreciated. One thing I had 'hoped' to see was a rise in CBC lending after the merger of Marfin Popular and Marfin Egnatia Bank in March 2012 when I expected the merged bank's obligations to Central Banks to shift from Greece to Cyprus but these figures appear not to show the rise I was hoping for (see my paper Not so lucky Laiki in blog below and at Not so lucky. I'm not sure if that destroys my argument or not. Again comments much appreciated. I have to make a few observations corrections to the above. The triple merger of Laiki, Egnatia, Marfin effectively began in 2006 when HSBC sold its share in Laiki to MIG. The merger was finalized in 2007. As for ELA. I reckon I need to make some introductory notes before going into the details. Although the mechanics of the bloody thing are unknown to all except the ECB and NCBs, there are some well known factors. During normal times (no crisis) euro-area banks would have no problem lending money to each other. Banks lend funds to each other wholesale with an interest rate equal to the Eurirbor at least. These transactions do not require the debtor to provide any sort of collateral in order to obtain the loan. The entire system works on trust between banks. Nowadays, cross-border interbank lending has dropped like a rock the ECB calculated that it fell by 20% in 2011 with an additional 10% in 2012. Therefore it is understandable there would be a liquidity crunch so the ECB stepped in. Unlike the interbank market the ECB requires collateral to provide funds such as marketable securities (corporate bonds, sovereign bonds etc)which have been rated as investment grade by at least one Credit agency. The bank gives the ECB collateral then the ECB applies risk weights on said collateral and gives back money at an interest higher than the EURIBOR depending on the risk attached to that security (usually sovereign bonds are given a risk weight of 0). I'd like to stress again that direct ECB lending is not the optimum scenario for any bank because they would prefer borrowing from the interbank market at more attractive rates. Sometimes banks do not have eligible collateral for direct ECB funding and that's when ELA kicks in. The ECB BoD along with the NBC where said bank is located, set up a marginal facility. The NBC receives a fixed sum of money which it then borrows to the bank at rates higher than those of the ECB direct funding programme. However as before the NCB requires the distressed bank to provide collateral only this time that collateral can be virtually any asset on the bank's balance sheet (loans, even buildings the bank owns, projected profits). Every time the bank needs more money from that marginal facility said bank has to mortgage another asset. Obviously this can't go on indefinitely as the bank will run out of collateral and will collapse. Now back to Laiki. After the merger in 2007 and before the crisis began in 2008, Laiki had no problems borrowing from the interbank market. When banks stopped lending to each other in early 2010-11 began Laiki could borrow directly from the ECB in exchange for sovereign bonds ( either Cyprus or Greece's bonds). We all know that as of 2011 Greece's bonds were rated junk. On March 2012 Fitch cut Cyprus sov.rating to below investment grade (BB-), S&P and Moody's had already downgraded Cyprus from as early as January. Therefore Cyprus bonds were no longer eligible collateral for direct ECB funding . The Central Bank of Cyprus asked for ELA from the ECB in order to keep Laiki afloat. 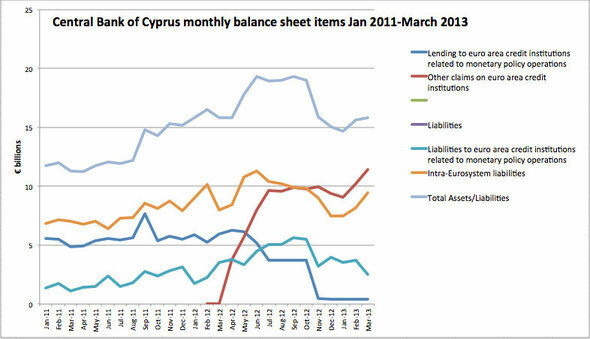 The facility was capped at 10bn (banks in Cyprus could draw up to 10bn in ELA) and was beefed up late February to 15bn. Laiki was in such a bad shape that it sucked on ELA ever since. Problem: as I've mentioned above Laiki received ELA by mortgaging a portion of its assets (totaling 17bn) with ELA standing at 11.4 bn (I am not sure but I reckon that Laiki didn't absorb 100% of that $$, I think BoC and Hellenic may be drawing funds from ELA as well) at the time of the bank's resolution makes one wonder. The bank must have mortgaged with the CBC 67% of its assets at least in order to receive funding. Bank assets as everyone knows include loans to households and corporations and given the dire state of the economy a good 20% of these loans are non performing especially those in Greece. Therefore the quality of Laiki assets is dodgy and I would be surprised if the Central Bank was unaware of the fact. Yet the CBC kept supplying ELA despite the risk of incurring losses (because Laiki was/is unable to pay back) to the facility. It is blatantly obvious that the bank was a zombie kept on life support for who knows what ends? Long read but I had to properly flesh out ELA/ECB direct funding/interbank lending.